Palm Beach Shores is a small but charming beach that is fairly exclusive to the people who live there and to the hotels and resorts directly on the beach. However, you can still gain beach access at hotels and resorts that rest on right on the beach though, so don’t worry. varieties of palm trees in Florida. coconut that was left on the beach. 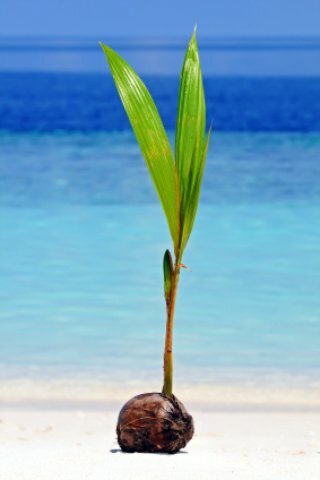 of a stately coconut tree that will one day be loaded with fruit. Tip: There is a public boardwalk that runs along this 'private' beach so take a hike; get some exercise and enjoy the luxurious homes and pricey resorts that line up along this exquisite beach. Adults can find peace, quiet and relaxation here while kids can run, play and just be kids. Fish like the locals do (and probably catch some good fish too) at Lake Worth Inlet or Inlet Beach. A visit to Flagler Museum promises to be filled of beautiful antique furniture and artwork that adorns this museum that once was a home to Henry Flagler and his third wife. CityPlace nearby offers stores galore where you can shop your heart out and enjoy some great dining. Kids of most ages: Float along the lazy river, slide down one of the 16 water slides, or splash away in the wave pool for a day of water park fun in the sun at Rapids Water Park. Eating: Coconuts is a great, beachy little place with affordable food. Or try The Islander Grill and Tiki Bar. Sleeping: Live like the locals do and enjoy a comfortable stay right on the beach at Palm Beach Shores Resort and Vacation Villas or Seaspray Inn Beach Resort.